Figures from the Central Statistics Office shows that in the year to November prices at a national level increased by 6.5%. This compares with an increase of 7.6% in October and an increase of 16.2% recorded in the 12 months to November 2014. The data also show that prices actually fell on a national level month on month in November by 0.5%. This compares with an increase of 1.6% recorded in October and an increase of 0.5% recorded in November of last year. In Dublin residential property prices decreased by 1.3% in November and were 3.3% higher than a year ago. Dublin house prices decreased by 1.2% in the month and were 3.1% higher compared to a year earlier. Dublin apartment prices were 6.1% higher when compared with the same month of 2014. However, it should be noted that the sub-indices for apartments are based on low volumes of observed transactions and consequently suffer from greater volatility than other series. The price of residential properties in the rest of Ireland rose by 0.2% in November compared with a rise of 1.2% in November of last year. Prices were 9.6% higher than in November 2014. House prices in Dublin are now 33.8% lower than at their highest level in early 2007 while apartments in Dublin are 41% lower than they were in February 2007. Prices in Dublin are 35.8% lower than at their highest level in February 2007. The price of residential properties in the rest of Ireland is 36.2% lower than their highest level in September 2007. Overall, the national index is 33.8% lower than its highest level in 2007. However, experts think that prices will rise by around 6% in 2016 and point out that the decrease in prices in Dublin has more to do with new Central Bank rules on lending than a downturn in the real estate market. ‘Given that the Central Bank’s rules on high loan to value mortgages apply only to first time buyers in homes over €220,000, their impact has been felt most sharply in the capital where affordability is most stretched,’ said Conall MacCoille, an analyst with Davy Research. ‘The recovery outside the capital began almost one year later, so that affordability is less stretched, and there is probably more room for catch-up,’ he explained, adding that the firm expects property prices to rise by some 7% through 2016 as wages grow and tax cuts take hold. Goodbody economist Juliet Tennant also believes that the Central Bank’s new lending restrictions, which limit banks from lending any more than 80% of a mortgage except in the case of first time buyers, have had an effect. ‘Macro prudential rules are continuing to have a dampening impact on the Irish housing market. However, the expiration of the Capital Gains Tax waiver at the end of 2014 also makes annual comparisons difficult. It will take some time for these distortions to wash through and it is likely that price growth will slow further before picking up again,’ she added. This entry was posted in Irish Property News on January 12, 2016 by Joe Wheeler. 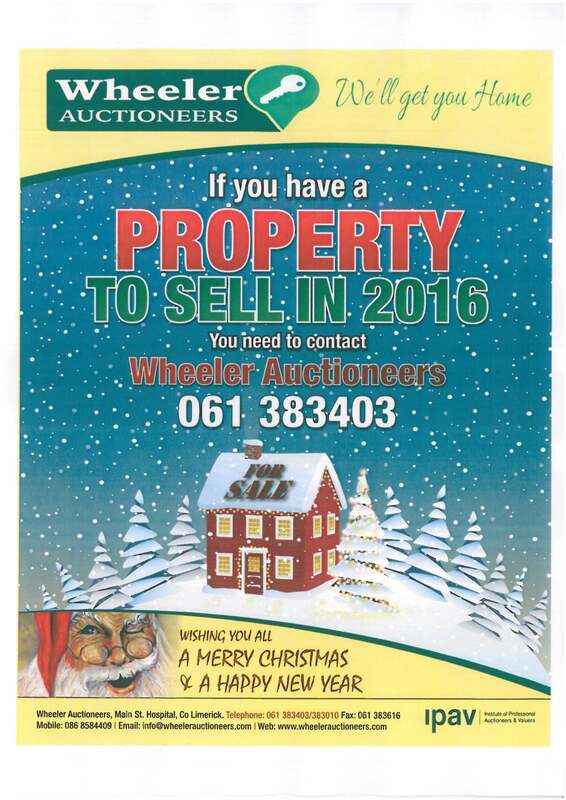 This entry was posted in Irish Property News on December 14, 2015 by Joe Wheeler. The OECD is warning that a strong rise in Ireland’s property prices recently may boost construction activity in the short-term, but risks a return to another property bubble. In its latest global economic assessment, the international think-tank says the Irish economy will grow by 5.6% this year. “Strong property price rises may boost construction activity further in the short run but also risk sparking another spiral of higher property prices and credit,” the report stated. It also said that the Budget should help get more people back into work “as those remaining out of the labour market still account for a large share of the working-age population”. But it has found “significant” risks remain, saying high debt levels leave the economy vulnerable. “Debt repayment, however, is likely to keep the momentum of household consumption in check. Inflation will gradually rise on the back of the increasingly tight labour market,” it stated. This entry was posted in Irish Property News on November 18, 2015 by Joe Wheeler. Irish residential property prices rose by 0.9% in March to push prices 16.8% higher on an annual basis, following falls in the previous two months. The month-on-month increase came after the first contraction for 10 months in January, according to the latest CSO figures. Property prices in Dublin were also on the rise again, climbing 1.1% in March to stand 22.8% higher than a year ago. Dublin house prices rose by 1% in March while Dublin apartment prices increased by 2.1%. However, the CSO warns the figures for apartments are based on low volumes of observed transactions and consequently suffer from greater volatility than other sectors. Outside of Dublin, residential property prices rose by 0.7% in March. Prices were up 10.7% compared with March 2014. At national level, residential property prices were 38.2% lower than their peak level in 2007. Dublin house prices were 36.9% lower than their peak, Dublin apartment prices were 42.2% lower, and Dublin residential property prices overall were 38.7% lower than their highest level. Outside of Dublin, residential property prices were 41.5% lower than their highest level in 2007. According to John McCartney, director of research at Savills, the return of faster house price growth may reflect a delayed market reaction to the Central Bank’s new mortgage lending rules. “Last October the Bank announced plans to make mortgage lending more restrictive. “However, it said that people with loan offers in place prior to the regulations becoming law would still be able to borrow under the old rules. “This led to a stampede for loan approvals in the closing months of last year. With these offers generally lasting for six months, time is running out for buyers with pre-existing approvals to borrow under the old regime. It may be that demand from these motivated buyers is behind the rebound in price growth seen in today’s figures,” he added. However, McCartney said this would be a temporary phenomenon and that the trend of moderating prices growth should reassert itself later in the year. However, in global terms, Irish house prices are still outpacing growth elsewhere. They increased 15 times more than the eurozone average in the final quarter of last year when compared to the corresponding period in 2013. That trend is set to continue, according to Eurostat, the EU’s statistics body. While the rate of growth slowed towards the end of 2014, Ireland had the highest quarterly increase in the EU at a national average of 16.5% compared to the same period last year. This entry was posted in Irish Property News on April 30, 2015 by Joe Wheeler. The average price paid for residential property in Ireland rose by 0.9%, according to the latest report from the Central Statistics Office. Residential property prices were up 16.8% compared to the same time last year. In Dublin, prices rose by 1.1% in March, and were 22.8% on an annual basis. House prices rose by 1% in March, with apartment prices up 2.1%. Residential property prices in the rest of the country rose by 0.7% in March, and were up 10.7% compared with March 2014. MORE than €10.7m changed hands in house sales across the city and county last month, with 75 properties sold. The latest figures from the Property Price Register, a national database of all house sales, show a buoyant January, with sales made above figures for the previous five years, as record began in 2010. In all, 1,584 houses sold in Limerick last year, with the county witnessing the biggest increase in sales in the country. No property in Limerick sold for over the half-million mark last month, however there was an increase in the number of properties selling in the €300,000 to €400,000 bracket. No 2 The Cloisters on the North Circular Road sold for €400,000; 12 Carrinderry, Rivers, Castletroy, exchanged at €382,000; Avoca in Newtown, Castletroy, went for €380,000, and Annville in Ballyclough fetched €315,000. By comparison, 64 houses sold in Kerry last month, with 51 in Tipperary, 59 in Clare, 107 in Galway, 236 in Cork, while 917 changed hands in Dublin, 18 of which broke the €1m mark. According to the property website Daft.ie, there are currently some 2,030 properties available to buy in Limerick, with 1,300 priced up to €200,000, a further 257 are priced up the €300,000, 60 are valued at over €400,000, and just four are priced over €1m, and have remained on the market for a long time. Meanwhile, in the rental market, rents in the city have risen by 6.2% in the last year and the average rent is now €702, according to the latest rental report from Daft.ie. In County Limerick, rents were on average four per cent higher in the final quarter of 2014 than a year previously. The average advertised rent in county Limerick is now €604, however it is still a fall of 21% from the peak. There are some 189 properties available to rent in Limerick, the most expensive of which is No 1 Rathlinn, Castleconnell, close by the Castle Oaks hotel. The four-bedroom property is for rent at €2,395. Its rental price has been reduced from €2,500 in recent weeks. Nationwide, year-on-year inflation in rents eased in the final three months of 2014. The national average rent between October and December was just under €950, that’s 9.7% higher than last year. However, this is down from a 10.8% annual increase in the second and third quarters and marks the first time since mid-2009 that rental inflation has eased. In Munster, rents rose by an average of 4.2% in the year to December 2014, compared to static rents a year previously. In the other city centres, rents continue to rise but at a slightly slower pace. In Cork city, rents are 7.3% higher than last year. In Galway they are seven per cent higher while Waterford city rental inflation was at 5.1% in the final three months of 2014. Rents across the four commuter counties were 14.1% higher than a year previously. This entry was posted in Irish Property News on February 23, 2015 by Joe Wheeler. “As it was, the proposals had dented confidence in the property market. “Now that they are going to be as severe as was feared, except for the 90pc LTV for first-time buyers up to a limit of €220,000, this major intervention in the market will lock many out of property for several years. Mr Davitt said his organisation was deeply disappointed that the Central Bank did not consult in any meaningful way with stakeholders. “If, as it appears, much of the import for these changes has come from international bodies, such as the International Monetary Fund, then we have to ask the question, is policy on property now largely outside of the control of the Irish people?” he said. Mr Davitt said the property market outside the main urban centres is still extremely fragile with properties still selling below the cost of building in most parts of the country. This entry was posted in Irish Property News on January 29, 2015 by Joe Wheeler. New mortgage rules announced by the Central Bank will allow first-time buyers some relief from the new 80 per cent loan to value limit. For first time buyers, banks will be able to lend 90 per cent up to a value of €220,000. Above that the 80 per cent limit will apply. The move will significantly reduce the amount of deposit which first-time buyers have to save when buying a home. However, the 80 per cent limit will be introduced for most borrowers, in a significant tightening of the current regime, designed to protect banks and borrowers from getting into difficulties with future lending. The Central Bank Commission decided on the new rules at a meeting on Tuesday. Non first-time home buyers will generally be restricted to borrowing 80 per cent of the property’s value. A 70 per cent limit will apply for banks lending to investors purchasing buy-to-let properties. Plans to phase in the new rules have been abandoned, with the higher limit on borrowings up to €220,000 designed to address concerns about the impact on first time buyers. Under the existing rules – which normally allow a bank to lend 90 per cent of the value of the house – a first-time buyer would require a €35,000 deposit on a home valued at €350,000. Under the new rules this will rise to €48,000. Had the 80 per cent limit applied to the entire loan, the deposit required would have been €70,000. The changes follow a consultation period on the proposed new lending rules. Original proposals to impose an 80 per cent cap on all new home-buyers had met a wave of opposition. The Central Bank said a certain number of loans – up to 15 per cent of loans by value for principal dwelling – could breach the new limits, offering some flexibility to lenders and borrowers. Housing loans for borrowers who are in negative equity and who are obtaining a mortgage for a new property are not subject to the LTV limits and will be assessed separately. The rules will also mean that people buying homes will face a limit that loans should not exceed 3.5 times income. Again some exceptions will be allowed on this. Switcher mortgage loans and housing loans for the restructuring of mortgages in arrears are not covered by the regulations. Central Bank governor Patrick Honohan said the measures would reduce financial vulnerabilities for lenders and borrowers. This entry was posted in Irish Property News on January 28, 2015 by Joe Wheeler.